Join the discussion on our forums! Come discuss Deadly Fork over in our dedicated Deadly Fork discussion topic. Deathrattle: put a Fiery War Axe in your hand. It becomes a rogue card. So it turned out that this card was pretty terrible. People have given a lot of reasons as to why. It's slow to play, it's awkward to play a 3 mana weapon you usually can't get earlier than turn 4, et cetera. All of these complaints are valid, but honestly, I think the biggest thing holding the card back is that - ironically enough - Rogue doesn't want to play weapon cards. Rogue is the only class that essentially cannot reasonably use their hero power while another weapon is equipped. Situationally, it's a decent grab from Journey Below. I had a game where I had the Coin and Morgl started with Tunnel Trogg and played another T2. I discovered Deadly Fork T1 and Coined it out T2. I traded that one card with both Troggs and a totem, long enough to make it to Dark Iron Skulker T5 (clearing most of the board) and Reno Jackson from 6 health T6. Actually it's worth considering this in Rogue decks that run Reno. It helps compensate for only having one Deadly Poison. And if you draw it late game you get a lot of value and it doesn't end up mattering that the weapon costs 3. I don't comment often, and I've never criticized a card. I try to find good uses for even some of the bad cards. That being said, this card is the worst I have seen. Equip a 3/2? Awesome. 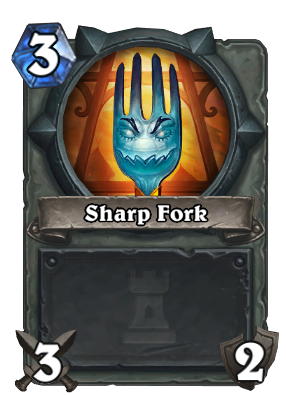 Add a 3/2 that costs the same as the minion? Ugh. I'm a rather creative individual but I can't really see this card working with other cards except for very, very specific situations (like if you suspect a Mirror Entity or something). Otherwise it's just fodder (and not even good fodder) that happens to also give up something after dying. The weapon token costing 3 is totally reasonable. It's equivalent to running an extra couple copies of Deadly Poison (without the flexibility of buffing your weapon on a turn after you equip it). While it may not be OP, it certainly isn't terrible and could very well find its way into some sort of Reno or N'Zoth Rogue. In arena this card will almost certainly be decent. Well, this is now just okay then. It's still better than using hero power and power it up. This card is a 2 mana card with a death rattle of - place a Firey Win Axe in my hand. My the time I can use the weapon (T3 or T4 depending on the coin), it's too slow. N'Zoth Rogue depends on Deathrattles with an immediate effect once the DR is triggered. Delayed DR effects like this is just bad. Garbage card this is. At 2 mana this card would be ok. At 3 mana it's trash. But if it equipped the weapon instead as the deathrattle, then the card would be way better. Alas, in it's current form it's crap. 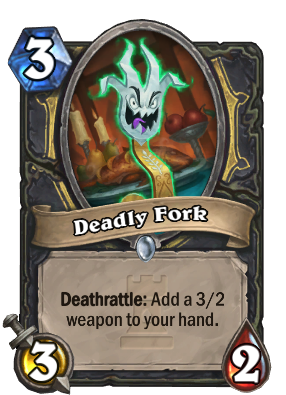 If the Deathrattle gave a 2-mana 3-2 "Fiery War Axe", then it would be a great card, but since the weapon is a 3-mana, that makes the card fair. If by fair you mean unplayable, then sure.